The American Statistical Association invites you to the annual Conference on Statistical Practice! 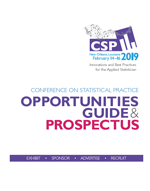 We welcome sponsors, exhibitors, recruiters, and advertisers to join us during this gathering of hundreds of statistical practitioners and data scientists. Your commitments to advertise, exhibit, recruit, or directly sponsor the meeting accumulate toward your sponsorship status. As a CSP sponsor, you will receive additional recognition for your support. Sponsor the CSP opening mixer. Make an impression on attendees who come together for an informal gathering at the beginning of the conference. Sponsor’s corporate logo will be placed on cocktail napkins used by every attendee at this event. This event will coincide with the opening of the exhibits and the 1st Poster Session of the conference. CSP's Breakfast is the more than just a quick bite to eat. Accompanied by electronic poster sessions, breakfasts are a popular time for attendees to gather informally. Sponsor both of the CSP continental breakfasts or chose Friday or Saturday. Perk up a CSP Attendee's Day! This sponsorship is available exclusively or on a one day basis. Help attendees navigate the meeting by supporting the conference app! This is a great interactive way to promote your message to attendees. A banner with your logo will appear on every screen and can be linked to the website landing page of your choice. Take advantage of one of the most prominent sponsorship options available. Your company's logo will be on the conference bag given to every registrant. Have a pen with your logo on it in every attendee bag. Distributed all attendees. With your help, attendees will be able to access wireless internet in the common areas of the conference. Sponsor WiFi for all attendees. Charging Stations give CSP attendees the ability to stay connected by charging their phones, tablets or laptops. Your corporate logo will be included on signage displayed at the stations. Your ad will be displayed on 12 electronic displays in high traffic areas of the conference including the registration area, the keynote session and the exhibit area. Take advantage of this highly visible marketing option. Provide us with 600 of your company’s flyers or brochures and we will include them as inserts in the conference bag for each registrant. Inserts are due by February 5! Sponsor a CSP event and increase your visibility with this growing meeting. Sponsor breakfast, coffee breaks, the opening mixer, or another event of your choosing. You event will be attended by hundreds of statistical practitioners and data scientists—including data analysts, researchers, and scientists—who engage in the application of statistics every day! Enhance the experience of each CSP attendee and leave them with a lasting impression of your support of the statistical and data science community. Sponsor the conference bag, pen, WiFi, Charging stations! Have another idea for sponsorship? We can build a custom option to suit your needs. Digital, online and print advertising opportunities through the CSP.